Today is Make A Hat Day! 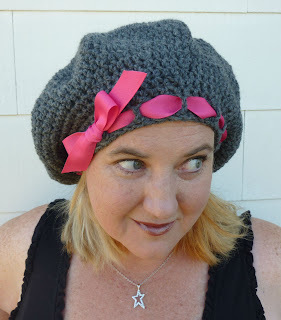 I thought it would be super cool to make a beret-style hat. I've made a lot of beanies in my day, and I've made some fun sun-hat type hats, but I had never crocheted a beret before now. I don't know what I was thinking. Okay, that was a lie, I will tell you exactly what I was thinking. 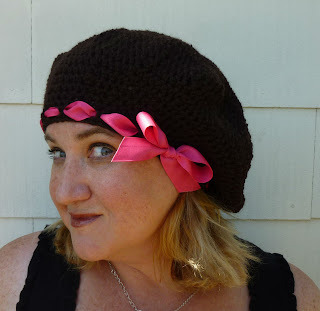 I assumed that it would be simple to do and I could come up with something fun and cute and fast and put up a fun free pattern that you could do in a couple of hours. I refused to give up on my perfect beret, so this time I used the wool to design my perfect (and not gigantic) beret. **Side note about hat design (skip to the next set of double asterisks if you don't care about the whys and only want the hows. I promise I won't judge you for wanting to get to the point! ): When you're designing a hat, you have to work with something called 'negative ease'. Some of you who are sewers (seamstresses?) should be familiar with adding ease to a pattern to adjust the fit, but for those of you who don't know what I'm talking about, ease is the difference between the measurements of your body and the measurements of the finished garment. In sewing, you want to add a few inches to that body number so that your finished garment will allow you to sit down without ripping out the seams. Since I had four different patterns to show me what I shouldn't do, this last pattern (lucky number 5!) actually came together pretty quickly. It really came down to measurements and math, which are much easier to work with when you've already worked out the aesthetics part of the design. 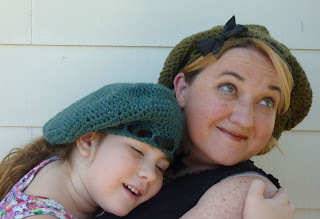 It is my absolutely favorite hat that I've ever made. I am sure that there will be other hats in my future, but this one was so hard fought that it will always be special to me. finished hat diameter across top is approximately 12"
Weave the grosgrain ribbon between the dc bars of R26. Tie the ends in a cute bow! Trim ribbon ends at an angle and seal cut ends with a lit match to keep them from fraying. **A note about yarns: I used 4 different colors of the same brand of wool yarn. Each one was labeled 210 yards. The first hat had about 10 yards of yarn left over when I finished. The second and third skeins had approximately 4 yards of yarn left over. The fourth skein was short about 4 yards, which necessitated ripping the hat out about 10 rows and switching to an F hook to re-crochet the hat in a smaller gauge. Or, if you don't want to make it yourself, you can buy one at my new shop. Grab one quickly if you want it, because I only have 3 available. Oh this is so lovely! And I especially love the ribbon woven around the bottom! Thanks so much for doing all that hard work and going back to the drawing board to get the perfect beanie! You and Mims are so adorable together in the photos! Hi Teeni! It was fun posing with Mims. I'm still a reluctant model. While I plan the posts ahead, I'm terrible about getting the pictures done early. This usually means that if it's a wearable item I've got to model it myself or no pics for the post! Hear, hear! You two are awesome models! You are ROCKING those berets! Those hats are SO CUTE!!!! I don't suppose you'd share the "mistake" one that resulted in the kid-size one.....? I'm thinking niece, I'm thinking Christmas gift. ;) And thanks for sharing your process too -- it's really good for us non-designers to get a feel for how hard you work to get a pattern to be JUST right! I love it, and oh my gosh Mims looks so cute, like an Angel. I just love how endearing the first picture of the two of you came out, so sweet. Mother and Daughter moments to cherish. She has got to be proud of her mommy, cause you're so talented, and I know you are proud of her, she's a bundle of joy, a gift from God. You always make my day, Piper! How do you know just exactly the perfect thing to say?! I am confuse of the 1st round..what is a magic loop? How many change to I crochet to make a magic loop? I love the hat and I really want to get started but I need to know the magic loop...Thank you so much...beautiful hat..
Hi Southernsweetie! <- Cute name! Welcome to the party!! I love new friends! This is abso-freakin'-lutely adorable! I like it best when you model your creations - I love your freckles!!! And you, Karen! I love old friends too!!! Thank you so much Jaime. The magic loop is very easy. Thanks..you are awesome..
Hi there!! I started making this Beret and i'm fascinated by it but it's time to start reducing stitches. I got confused right at line 17. I make 1 chain, then 7 HDC and then? HDC2tog plus 14 HDC 7 times? then HDC 2tog +7HDC? i'm not getting it. Can you kindly help me? I'm almost done and really want this beret!! Thanks. Hi Anonymous! It sounds like you've got it. I had to stagger the decreases so that the hat wouldn't end up with points... So this is one of the staggered rows. You repeated it back exactly right, so I'm not sure how I can help you exactly. Just do EXACTLY what you just wrote and it should turn out perfectly! Hi Jaime. I did email you. My beret is a mess. It's like a huge tortilla. You said one skein will be enough? I ran out of yarn and do not have anymore of that one nor at the store. I guess this beret it's not for me. Thanks anyway. Hi Haydee! For some reason your email went straight into my spam mail, and I didn't get it. I've sent you a reply. I think the problem is the decreasing, so I've sent you a link to the best tutorial on decreasing stitches that I've found. Thank you Jamie..I will check for a response. Beautiful hat. Thank you for all the work you did it really is a perfect hat! Thanks for sharing. Hi Lilacrosesandthemoon! Aww, thanks. And thank YOU for checking it out! How awesome to chat with another Jaime M! Yay! Oh man, I admire you for being a twin-mom! Sounds like so much crazy fun, and really hard work! I'm sorry about the measurements. That must be a pain. I will have to research the differences to see if I can write my patterns in a way that everyone can know what I'm talking about. The Craft Yarn Counsel has pretty much brainwashed us over here into thinking that Worsted Weight Yarn is a universal thing... LOL!!! I just finished my hat and I guess my stitches must have gotten tighter and it's a little snug. Any suggestions? I guess the next one I make I should either relax my stitches or should I maybe start with a large hook? Hi Rosie! Go up a hook size before you try to relax your stitches. You'll get a more even gauge if you aren't having to think 'relax, relax, relax' with each stitch. :-) Thanks for trying the pattern! Thanks! I'll try that. I love the pattern, it was so easy and quick. Hey there! Got sidetracked with another project but as soon as I get the ribbon to finish the hat, I'll send you a picture. Hi Kelly! If you're a tight crocheter, I would go up a hook size and you should be good. 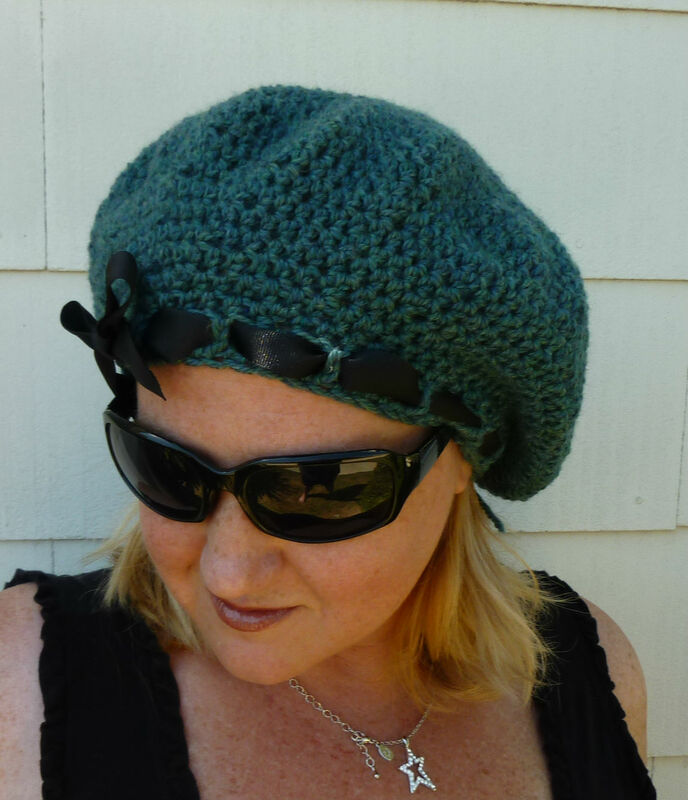 If you crochet towards the loose side, a G hook should get you a beret the right size. Red Heart Super Saver is about the same thickness as the wool I used, but the sparkle yarns are significantly thinner despite being labeled 'worsted'. A good way to check is to measure it after you finish round 16. If it doesn't measure between 11 1/2 and 12 inches, it's not going to come out the right size. I love this pattern and I am about to start making one for a secret santa draw I have.. however I bought red heart super saver yarn (which I hope works) are there any revisions for using that yarn, or will it work out just fine..? Hi LuckiStarz! I think you'll be just fine with the Red Heart. Like I told Kelly, Red Heart Super Saver is about the same thickness as the wool I used, but the sparkle yarns are significantly thinner despite being labeled 'worsted'. 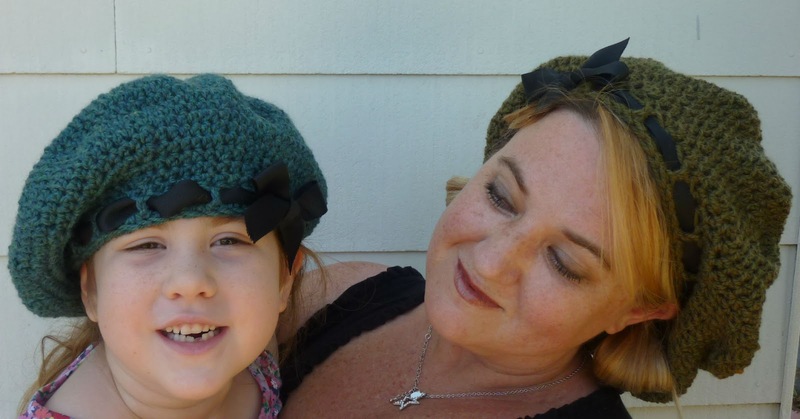 Jaime, my granddaughter has long hair and would like for me to make the old time hair snood...does this beret have enough room for her hair? Maybe you'll come up with a pattern--I'll keep watch. Hi Dee! This beret is big. I have a fairly large head, and it holds all of my longer-than-my-shoulders hair. I am very confident that it would have plenty of room for her hair, unless she's got Disney-Princess super thick down-to-her-kneecaps long hair. If your granddaughter is Rapunzel, I'd add a few plain rows (like maybe 3) between Row 16 and Row 17 (just hdc in all stitches, sl st to 1st st to join rd). What a great question! I'll be interested to know how it turns out!!! You are correct! Whoops! I've changed it. Thanks for the heads up! Jamie! My name is Christine, and I am a college student that picked up crocheting as a hobby a couple months back! I love this pattern, and I recently made a scarf with this light blue bulky weight yarn that has buttons on the end so you can button it together. I was thinking that I would take this pattern and just put a band at the bottom with a button or two. However, I wanted to know if I could make this pattern work with the bulky weight yarn. Any suggestions? Follow the instructions until the circle of the hat is about 11-12", then begin decreasing from the row after the decreasing row that has the same number of stitches as your circle does. Follow instructions to the end, trying on the hat at the end to make sure that the final band isn't too big. Have I completely confused you? ;D Just take it one step at a time and have fun! Email me at CrochetDynamite@gmail.com if you run into any problems and I'll try to help. I am on the 13th row and it is just a large circle. Should it be curving at this point? Hi! Um, no. You can start decreasing on the 13th row if you want, but I didn't begin the decreases until the 17th row. The beret shape has a flat top, so at the 13th row it's just going to look like a big floppy circle. 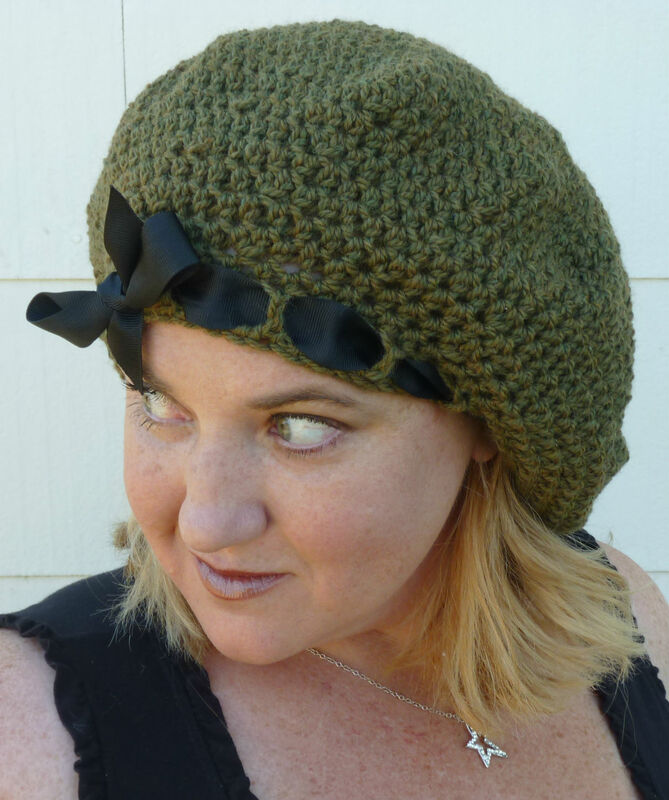 Just finished your amazing baret and thank God that it's a present for a friend, as it turned out way too small for my huge head....my friends head is way smaller than mine so I have good hopes that it will fit her perfectly! And if i make one for myself, I now know that I'll use a hooksize larger....thanks for the great pattern! Greetings from the Netherlands! I don't have a magic loop. Pls give alternative suggestion. Nevermind...i figured it out. I'm an old fashioned crocheter...not used to some fancy terminology. I'm eager to try this pattern, your beret looks great! I want to make one for my 3 year old niece though (head circumference of approx 19 inches?). I'm quite new to crocheting, so how do I go about making it a smaller size?? Is it down to the hook I use, or the weight of the yarn - or both?! Hi Melissa! I actually made a smaller version of the hat, it's called Fireside Girl Beret and it's in my free patterns list (look at October 2012). I made it for my 5 year-old daughter, but I've got a friend who said it fit her 1 year-old niece too (but I think she crochets a little tighter than I do!). Hope this helps! Been looking for a chemo hat for a friend; she'd swoon over this one. Thanx for the instructions and all the labor it took to get there! So, I used to crochet as a child and was taught at my grandmother's knee. She saw no use for patterns so I never learned patterns. 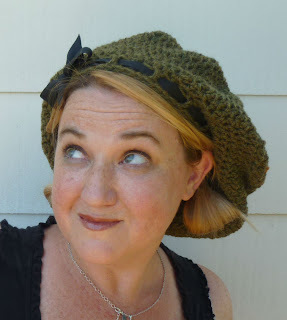 Now, 30 years after putting down the crochet needle, I'm determined to do your beret. I figured out all the abbreviations and learned how to make a magic circle. I got lost when you started using parentheses. I can't tell if I'm skipping some of the single stitches or if I'm doing 2, 3, 4, hdcs every third and then one hdc for the other two. I've tried a number of ways and my numbers aren't coming out the same as yours. I'm quite sure I'm just not comprehending that part of the pattern. Would you be willing to help a re-newbie by breaking it down a bit more? Thanks. I'm just learning to read patterns and I found this on AllFreeCrochet.com and wanted to make it for my daughter. I have the first 3 rows done but I'm having trouble understanding the pattern. On R4: (2 hdc in next st, 2 hdc) 8 times and it's supposed to be 32 stitches... Does this mean to hdc in every other hdc of the previous row? On R3 I did 2hdc in the first followed by 1hdc in the second and repeated this all the way around and did come up with 24 stitches. I'm having a bit of trouble with the math I think. Just can't seem to get R4 to work for me. I'm probably not making much sense as this is the second pattern I've tried to read without much luck. Sorry, I just realized that I misspelled your name.